Working For The Group Real Estate As An Agent! As I have highlighted in the last few blogs, there are certain things that set us apart as a real estate brokerage from other brokerages here in Southeast Idaho. The main reasons are the pieces highlighted in previous blogs. As I have gone through and done research on each of these technological pieces, these are the main reasons for joining The Group Real Estate. We utilize every technological advances you can think of. We have multiple employees working here (the Broker included) who will take every photo you have taken and edit them however needed. One top of this, we will get them proofed by you, as well, and if we need to change them up even more, we will do that. If you want us to take the pictures for you, we will do that, as well. We have high end cameras here that you can either borrow, or send out one of the employees to go and take the pictures for you. To which we will also edit them to specification. After the pictures have been taken, we automatically create a quick blog on your listing. We make these, so that they can be added to Facebook groups and other social media outlets. As we use the pictures we have used in the blogs, we will also highlight these on Facebook. We have someone doing complete write ups and links to the blogs, to your pages, etc from these social media outlets. Now, the key here is that we use what are called meta-tags and keywords to get the content out there. As this starts to take more traction, as people are searching for specific ideas, things, wants, etc on the internet, these keywords and meta-tags will ping them to our sites, to our listings, to our marketing, and so forth. This is where other pieces come into play for the marketing and advertising of the listings. When someone is dropped into one of our blogs, be it from Facebook, a Google search or directly going to our website, they will not only see a write up on the listing with some pictures, they will also see the Matterport 3D scan and drone video you had done on the home. These are two other amazing features that we offer. This showcases to your client that you are willing to go above and beyond for them on the advertising of their home. The Matterport is an amazing way to show off the home. As so many people love to have that “hands on” approach in today’s world, this is one of the better ways to do so. It will give them this approach, as they go through the home with one or two clicks through the home. 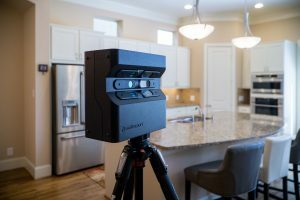 The Matterport takes a full 3D scan of the home, letting you walk-through the home as if you were there. You are able to go room to room, door to door, looking through the home and seeing all of it’s intricacies. Another great piece added to the Matterport is pinpoint dots where we can enter in YouTube videos, more blog work, articles on items, etc. to highlight even more of the home. The drone videos give you an even better look at the home that normal land-locked pictures just aren’t able to capture. As you look at the drone footage, it gives the eye and the ears something completely different to look at. The eye loves seeing big swooping arcs and angles, and great music to add to the beauty of the home and the property. As we look at drone videos, there is an even better way of highlighting the surrounding property, whether it be an amazing park or trees nearby. The drone video can also highlight the ins and outs of the home you are listing. You are able to take it through the home and when you do so, you can show doors that can be opened, lazy Susan’s, or the ins and outs of closets. These are just a few of the great pieces of technology that we use to showcase your listings. Not only do we have these technological advanced pieces to help you in your listings to help your clients out in the selling of their homes. Some of the other great pieces that we have to offer, are a transaction coordinator, someone who is here to help you with Addendum, to help take in some of the commission side of things, and reach out to Title Escrow Officers for you. It is a wonderful in-between that helps you truly focus on the main part of the job that seems to be lost with a lot of Realtors. Being very customer-centric (a phrase we love to throw out here at The Group!) real estate professional for your client. The transaction coordinator also helps with getting tours ready, so we are able to go out and tour the listings that we have on the market at that time. Twice a week we offer training’s. One of them is a mandatory training to start of the week where our Broker goes over all the listings and transactions you may have going, answers questions you may have, going over goals, and relying heavily on the Ninja Training, a course that is heavily touted in showcasing the best way to be a better Realtor. We offer a free version of this course here, so you are held accountable, in the best way possible, to the goals that you have come up with and the best strategies to help you succeed in your Realtor business. Not only do you get the very best training, the very best skills, and the best technological advances, you are brought into a wonderful culture where you will feel as though you are always held to your very best. It is an atmosphere unlike any other. The entire staff, and team of Realtors, has nothing but all your best intentions in mind. Very family oriented. And all the goals that you have, will have, and are meant to have are always ready to be buoyed up and found with positive reinforcement, no matter the goal. There is something to be said about a great place with a great culture. And this is that place. Come join us!